This past weekend, my friends and I organized a trip up to Connecticut for some fun fall activities. After weeks of struggle trying to coordinate a group of people the day we wound up going was rainy and grey. I'd brought along blog outfits and tried to look cute for some outfit photos, but that lasted about 10 seconds before I gave up entirely and just tried to have fun. It was hot and muggy and drizzling, but it still wound up being a great day. I met up with Marko, Igee, and Albert early at Grand Central Station and we made our way to the MetroNorth train heading to Westport. We could already tell the day was gloomy but still held out some feeble hopes (or maybe that was just me). Reed picked us up at the station and we met up with Kate and Caity at nearby Terrain, a cute store and restaurant I've eaten at before. After an excessively long wait we were finally seated and enjoyed a great brunch. 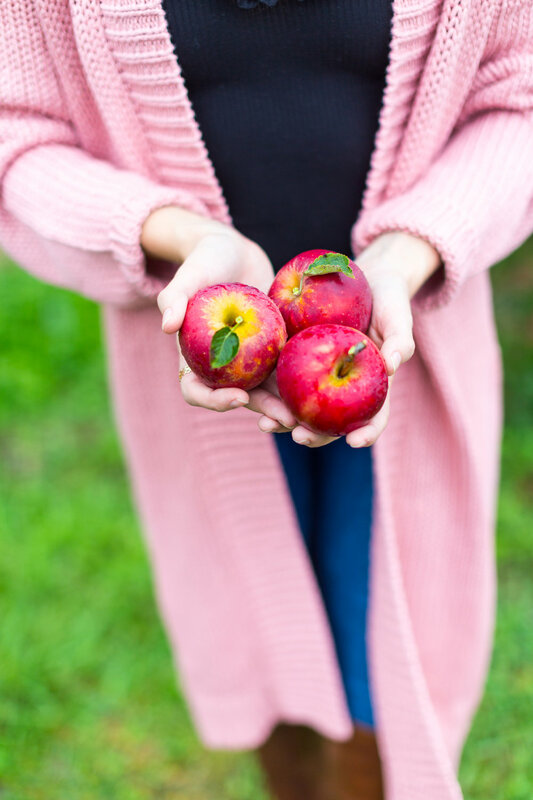 We then headed to Blue Jay Orchards to pick some apples and despite the misty rain, we still got some cute photos while meandering through the rows of Macintosh and Fuji. Like I said, I'd had some cute outfits planned, but once I started getting rained on I just tied my frizzed hair back and gave up trying to look cute. After awhile at this adorable orchard, we drove on to Newtown, where Reed grew up, stopping en route at a great roadside dairy farm for some homemade ice cream. We eventually wound up back in Westport and ended the day with some yummy tacos at Bartaco. All in all, despite the crappy weather, we all got by with a little help from our friends.